The AAS election of Officers and At-Large Trustees for terms beginning in 2018 is now under way. New Officers and Trustees will help decide the Society's direction and goals. The best way to ensure that your voice is heard is to vote! 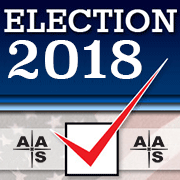 The ballot is online via a link from https://aas.org/governance/vote-aas-and-division-elections and includes links to statements from all the candidates. Vote today! Balloting closes at 11:59 pm EST on 31 January 2018.